Why Intellectual Property Rights? A Lockean Justification, by Professor Adam Mossoff, is probably one of the most important papers written on property rights in over a century. The point of the paper is to show Locke’s labor (physical and especially mental) theory of property rights provides the moral justification for intellectual property (copyrights and patents). One of the strengths of the Lockean property theory is that it recognizes that IP rights are fundamentally the same as all property rights in all types of assets—from personal goods to water to land to air to inventions to books. The paper clearly shows that Locke understood that it takes both mental and physical effort to obtain those things man needs to live. Anything that man makes valuable through his efforts, he obtains a property right in. Locke himself expressly justifies copyright as “property” and approvingly refers to “Inventions and arts” in his summation of his theory that property arises from value-creating, productive labor that supports the “conveniences of life” in § 44 of the Second Treatise. In 1690, the legal concept of patents (property rights in inventions) did not exist yet, and so this is an explicit indication of Locke’s willingness to include what would later become the legal concept of patents within his property theory. Interestingly Locke distinguishes between copyrights (and patents by extension) and monopolies something that many modern critics of patents are unable to do. I have argued that the term of a patent should be 35-40 years for the same reason. As I have explained here, no property right is eternally. Dead people do not have property rights. Another misconception about property rights is that they are the same for every object or value created by man. As Mossoff explains Locke did not make this mistake. This naturally leads to a final observation: Given differences in produced values in the world, such as a water well, domesticated animals, a fecund farm, the desert sand used to make silicon for computer chips, air, broadcast spectrum, corporations, stock, credit, future interests, inventions, business plans, books, paintings, songs, and the myriad others, the specific legal doctrines that protect these values will vary. It is amazing how many people miss this point, which leads to all sorts of erroneous ideas about what property rights are. This is perhaps the most important point in the whole article. Property rights are highly misunderstood in today’s world by both lay people and academics. They are even misunderstood by many supporter of capitalism, particularly libertarians and supporters of Austrian Economics, but also by Objectivists and supporters of Ayn Rand. Libertarians and the economics profession in general have accepted the utilitarian justification for property rights, which is a misnomer and turns property “rights” into arbitrary government grants. In addition, it fails to explain how property rights are acquired, who they belong to and why, among other problems. Rand also discusses property rights in the chapter Patents and Copyrights in Capitalism: The Unknown Ideal. While she has some keen insights, she never developed a fully articulated theory of property rights. In my limited research into the history of property rights theory there was excellent research and work starting around Locke and the Enlightenment. Before that property rights were derived from the King (government). In many ways the economics profession, particularly the Austrians have gone backwards to the idea that property “rights” are whatever the government says they are. Scholarship continued on property rights particularly in the United States at least until the first Homestead Act, which showed a clear understanding of property rights. However, that research had died by the time the FCC was created in 1934. Locke, the Founders, and Ayn Rand understood that property rights are the cornerstone of freedom. Modern libertarians often think property rights can be replaced with contracts. This is confusing cause with effect. Contracts rely on property rights not the other way around. Some Objectivists undermine property rights by rejecting Locke, the Founders, and Rand’s understanding that each individual has a property right in themselves (Self Ownership or Self Sovereignty). This is also based on a misunderstanding of what property rights are and how they are derived. Let’s hope that Adam Mossoff will continue his excellent work in this important area. Ridley’s sole argument about Edison rests on the idea that other people were working on the problem. Thousands of people have tried to solve Fermat’s last theorem since 1637. Does that mean Andrew Wiles proof in 1994 was inevitable? Alternatively, only Edwin Armstrong worked on and invented FM (frequency modulation). Does that mean FM was not inevitable? Perhaps Ridley’s position is not shared by most libertarians. Yet, a recent panel discussion on Reason TV, part of the libertarian magazine Reason, shows Ridley’s position is widely shared. One panelist compared patents to slavery and taxi medallions. Another panelist made Ridley’s point that most inventions were never patented. But, if you eliminated everything in your house that was subject to a patent or made by a process that was once patented, your house would not exist. Most people will quickly understand that all the electronics would be gone, but so would the refrigerator, the electrical power, and even the glass in your windows was subject to patents extending back to Venice. This is a review of Carl Menger’s book Principles of Economics published in 1871. I will be judging this book on three criteria: 1) Is it adhering to the philosophy of science? 2) Does it address the question of what is the cause of real per capita increases in wealth? and 3) Does it address the question of what was the cause of the industrial revolution? These last two questions are the most important in all of economics and it is impossible to write something that is profound if it does not address a profound question. I will also be analyzing Menger’s “subjective” theory of value and prices. Menger addresses this issue in the Preface. He discusses the remarkable advances of the hard sciences and the high regard in which they are held. He also laments that economics is held in very low regard. Menger however never states why it would be improper to use the philosophy of natural sciences. He implies that he is using the “empirical method” however he never explains what he means by that. The rest of the book has almost no empirical evidence in support of Menger’s positions. Menger’s lack of clarity on this point is consistent with much of the rest of the book. This means that it is often possible to argue that Menger held two contrary positions and find support for both in this book. This in and of itself is support that Menger did not follow the philosophy of science, however it is a useful rhetorical tool. In addition, his major protégé, Ludwig Von Mises, explicitly rejects the philosophy of science, in favor of philosophical rationalism. Menger’s major intellectual influence was Franz Brentano, an Austrian philosopher best known for his works related to psychology. Brentano wrote a book entitled Perception is Misception, in which he claims that perception is erroneous. “In fact he maintained that external, sensory perception could not tell us anything about the de facto existence of the perceived world, which could simply be illusion.” Since Menger considered Brentano a friend and intellectual influence and Menger did not refute this position, it is reasonable to assume that Menger was sympathetic to Brentano’s anti-perception idea. This anti-perception point of view is very reminiscent of Plato. Plato’s ideas are not consistent with science. The overwhelming evidence is that Menger did not follow the philosophy of science. This means that none of the major Austrian economists, Menger, Von Mises, or Hayek based economics on the philosophy science. Austrian economics is not a science. This section, The Causes of Progress in Human Welfare p. 71, is the part of Menger’s book I consider most important. It also appears to be the payoff for pages of description of first, second, third, etc. order goods. Even Menger admits that his definition of these is a bit vague, however first order goods appear to be consumables or consumer goods. Menger argues that economic growth is the result of creating more second or high order goods. This is just a long winded way of saying increasing capital goods causes economic growth, which had already been said by many other economists. Not only has this already been said by other economists, but it is wrong. He also has one throw-away line about human knowledge. He never builds on this, he does not explore how human knowledge is created, how it results in increases in economic wealth, or what knowledge is important to economic growth. His followers, such as Mises also do not build on this, they all focus on increases in savings and capital as the cause of growth in the economy. In a technologically stagnant economy adding more capital at best can lead to some sort of optimum output, but can never exceed this level. (I describe and provide evidence for this in much more detail in my book Source of Economic Growth). As a simple example, imagine Robinson Crusoe fishing with a spear. The spear is a second order good or higher under Menger’s approach. Now if Crusoe creates more spears will he have more fish? No, since he can only use one spear at a time. At best having more spears will allow him to replace his spear more quickly if he breaks or loses a spear. Another example is that if every farmer that can use a tractor has one, then giving them more tractors will not increase the production of first order goods. This has been shown empirically and Robert Solow’s paper (Solow, Robert M, Technical Change and the Aggregate Production Function, The Review of Economics and Statistics, Vol. 39, No. 3 (Aug., 1957), pp. 312-320) is just one of many that prove this. Menger fails to answer the question of what causes real per capita increases in wealth. Menger never mentions the industrial revolution in this book. The Industrial Revolution is the first time that people escape subsistence living (the Malthusian Trap) in large numbers. It is the most significant event in the economic history of the world and Menger shows no interest in it. By the time Menger wrote Principle of Economics the Industrial Revolution was at least seventy years old and had exploded in the United States. This shows a profound disinterest in the empirical side of economics. It would be like an astronomer ignoring and eschewing the telescope or biologist who refuses to do or even explore the results of dissections. Menger does not compare the economies of different countries or the economy of a country at different times, despite the profound differences in the economies of countries around the world. This is not how a scientist thinks or works. Instead Menger examines propositions in his own head, like the monks of the middle ages arguing over how many angels can dance on a pin head. Menger’s style is completely consistent with Mises praxeology – philosophical rationalism. The cause of real per capita increases in wealth is increasing levels of technology (new inventions) and the cause of the Industrial Revolution is legally enforceable property rights for inventions (patents) as William Rosen, shows in his excellent book The Most Powerful Idea in the World and I show in my book Source of Economic Growth. Menger does not discuss inventions, technology, knowledge, patents or their importance in economics. Menger fails to add anything useful to the two most important questions in all of economics. Menger also makes this distinction between real and imaginary goods. He appears to be making a point about objective values, however he never does anything with these concepts once he introduces them. Note that Menger never defines what he means by needs. Are needs anything someone wants? Menger never says. Then he talks about the satisfaction of needs. Is this a personally, subjective decision? Menger never says. On the other hand if you want to say Menger was advocating the modern value subjectivism of Austrians, then you can find these quotes. Another factor favoring the subjective theory of values is that Menger is clear that ethics and morality are outside the study of economics. Here he is talking about the morality of charging interest, however it is clear that this statement is a more general statement about economics. This suggests that Menger’s ethics, like most Austrians, is some version of Utilitarianism, which means he rejects Locke’s and Rand’s Natural Rights. Another quote that supports this point of view is Menger’s ideas of property. The first quote is really Menger’s definition of property. Note that this over 200 years after Locke. It is a clear rejection of Locke and Natural Rights. The second quote is a forerunner of the inane idea that property “rights” are socially useful tools for allocating scarce resources adhered to by Austrians. Menger’s position on subjective value is confused. Note that this is not the work of scientist, which shows once again that Menger’s ideas are not based on the philosophy of science. Despite this Menger’s rejection Natural Rights, rejection of ethics in economics, and the direction his students took suggests that on balance Menger was an advocate of the radical subjective theory of value. I undertook this task because a number of people I have respect for argued that Menger was not the same as Hayek or Von Mises. In addition, a number of well-known Objectivists have tried to reconcile Austrian Economics with Objectivism. I have analyzed in depth the irrational roots of the two main branches of Austrian Economics: 1) Hayek and 2) Von Mises. I have shown that the positions of Austrians on a number of positions are absolutely flawed including their position on property “rights”, the Austrian Business Cycle, their position on fractional reserve banking, and their position on intellectual property. Carl Menger has not proven to be the savior of this fall from grace. This is not to say that other schools of economics are better or that there is nothing useful in Austrian economics. For instance, Menger’s marginal utility is a useful concept, but hardly profound. I found Principle of Economics boring, repetitive, and written in the pseudo-scientific style of many pop management books or psychological self-help books. This is consistent with other books I have read by Austrians. The best writer among the major Austrians is Hayek. I did not force myself to read every word of Principle of Economics because it is boring, repetitive, and non-scientific. I will not apologize for not reading all of a book that is clearly not based on science. I also will not waste my time reading anymore books by Austrians. I know more about the underlying tenants of Austrian economics than many of its proponents, just as I know more about the underlying tenants of christianity than many of its proponents. Objectivism and Austrian economics are incompatible. I think many Objectivists are fooled into supporting Austrian economics because they talk about free markets. Austrian economics is not the product of reason, the Enlightenment, and the philosophy of science. It is best described as a branch of the Scottish “Enlightenment”, which really was a counter enlightenment movement. If Objectivism wants to make progress in economic science it needs to wall itself off from Austrian economics. https://mises.org/library/philosophical-origins-austrian-economics, The Philosophical Origins of Austrian Economics, Mises Institute, by David Gordon, June 17, 2006. Can Patents be a True Property Right When They Expire? Opponents of patents often like to refer to them as a monopoly, which is a thoroughly discredited idea (see here, here, here, here, and here). Another argument they often raise is that “real” property rights do not expire, they go on in perpetuity. Since patents and trademarks expire after a certain period of time, they cannot be true property rights. To answer this question, it is necessary that examine the nature of property rights more carefully. You obtain property rights in something because you made it productive or created it. Of course you can also trade your rights in something you created for currency and then contract to buy something else, thus obtaining property rights in the item. Your rights in say land are limited by the activity you undertook to obtain those rights. For instance, if you farmed the land and say put a house on it, then you have a right to continue those activities and ones reasonably related to them. However, this does not mean that your property rights extend to the center of the earth or up infinitely into space. It also does not mean you can put a huge pigsty on the edge your land next to your neighbor’s house. Note this was/is true under common law, no need for regulatory law or home owners’ associations. Property rights are part of the system of natural rights, which are based on the foundation of self-ownership or self-sovereignty. Capitalism: The Unknown Ideal, What is Capitalism, p 10. Locke also based natural rights on self-ownership or self-sovereignty. These ideas are not axioms but derived from observation and logic. You obtain property rights in something because you created it or made it productive. Since you own yourself, you own those things you create, however the limits of your property rights are determined by what you created (made productive) and some practical legal implications. When it comes to land, most people obtain property rights in the land because they farmed it or made it useful for habitation or both. These property rights do not go on forever as commonly conceived. Dead people cannot own something, only living people can have property rights. When a person dies their property rights expire including their property rights in land. The heirs do not acquire the property rights in the land (assuming they were not an active part of making the land productive), they just receive the first right to acquire the property rights in the land, by making it productive. If they are unable to make the land productive or they are otherwise not a productive people they will quickly have to sell the land to someone who can make it productive. You might argue that the law does not precisely follow the philosophical basis of the law and that would be correct. However, the law has to consider factors that the pure philosopher does not, for instance, efficiency, evidentiary issues, and certainty of title. If the ownership of land and other property were not passed to the heirs in the form of first right to acquire, then every time someone died there would be a free for all to acquire the land, etc. This would lead to fights, both legal and physical. This would defeat the legal goals of efficiency, evidentiary clarity, and title clarity. However that is not to suggest that the system we have “inherited” for the disposition of estates is perfect or the best. In the case of patents/copyrights the most philosophically correct position for the length of a patent/copyright (from this point forward I will just discuss patents) would be the inventor’s life. However, this would cause all sorts of practical patents. The patent for a first inventor could issue and one day later the inventor could die, while another inventor could live for another seventy years. This would be unjust. More importantly it would make it very difficult to verify if a patent was still active. Last it would make it very risky to invest in company built around an invention that was patented. Imagine that you are asked to invest in company whose main asset is an invention that could be worth hundreds of millions of dollars, however if the inventor dies tomorrow the company would lose its most important asset. These practical realities of the law mean that patents should have a certain set period of time. The patent cannot go on in perpetuity because the inventor’s heirs cannot make the asset productive as in the case of land, so they cannot reacquire the patent rights. The US has tried out a number of different term lengths for patents. Presently, it is 20 years from the date of filing and that makes it essentially uniform with the rest of the world. My suggestion would be to make the term of a patent closer to half a person’s life, since most people do not invent things as a child and there is absolutely no macroeconomic evidence that stronger patents have ever inhibited the economy. Rand in other places states that Rights are based on the right to life. She necessarily had to mean the right your own life, to be consistent with inalienable rights. It is clear that she was not opposed to the idea of self-ownership and did not see this inconsistent with the idea of natural rights. It is also easier to understand natural rights from a self-ownership point of view than a right to (your own) life. It is beyond the scope of this paper to explain the derivation of natural rights by Locke and Rand. 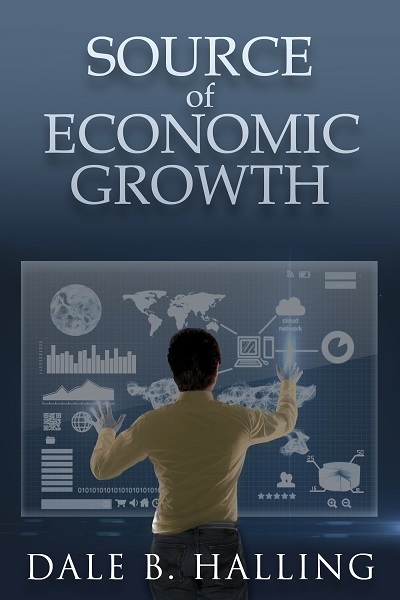 Dale B. Halling’s new book Source of Economic Growth is now available. This book examines the two most important questions in economics: 1) What is the source of real per capita economic growth, and 2) What caused the industrial revolution? The industrial revolution is important, because it is the first time any large group of people escape subsistence living (Malthusian Trap) and their incomes start to grow. By examining these questions, the book devises a science of economics that is consistent with natural rights, the founding of the United States, and is tied to the biological reality of life. Mr. Halling gave a related talk at Atlas Summit 2015 entitled The Source of Economic Growth. No school of economic thought is consistent with Objectivism, which is why Ayn Rand, in the very first sentences of “Capitalism: The Unknown Ideal”, said “This book is not a treatise on economics. It is a collection of essays on the moral aspects of capitalism.” Patent attorney and novelist Dale Halling proposes a science of economics that is consistent with Rand’s philosophy. The path to that understanding of economics results from examining the source of real per capita increases in wealth, which puts man’s mind at the center of economics. No other school of economics puts emphasis on man’s mind, which is one reason why Rand had a tenuous relationship with even free market economists. The Economist has printed another of their fantasy articles on patents entitled “A question of utility.” Gene Quinn has written a great article showing the numerous inaccuracies in The Economist’s article entitled “What ‘The Economist’ Doesn’t Get about Patents.” The Economist article argues that patents were irrelevant to the industrial revolution. Mr. Quinn shows the fallacy of this statement, but I want to amplify on what he said. The industrial revolution started in England and the United States, which were the two countries with functioning patent systems. The industrial revolution was not about industry but about a continuous invention revolution as the book “The Most Powerful Idea in the World” illustrates. Modern ‘New Growth Economics’ has shown that the only way to increase real per capita incomes, is to increase our level of technology and that means creating new inventions. My new book Source of Economic Growth tackles these important questions specifically it answers these two questions: 1) What is the source of real per captia increases in wealth? And 2) What was the cause of the industrial revolution? I provide overwhelming evidence that new inventions are the only way to increase real per capita incomes and property rights for inventions, i.e., patents, are the only way to provide a high enough level of inventing to escape the Malthusian Trap and enter the Industrial Revolution. The Austrians, such as those on the Von Mises website, like to tout that they are pro-freedom, capitalists, and arch enemies of the socialists and Keynesians. Strangely enough this means that they have aligned themselves with socialists in opposing property rights for inventors and attacking Locke’s ideas on property. Even more fundamentally the Austrians seem to share intellectual roots with the socialist or more broadly the post-modernist movement, which is a reactionary movement opposing the enlightenment, reason, and science. I have written on Fredrick Hayek’s anti-reason, anti-natural rights, moral relativist positions in Hayek vs. Rand: Patents and Capitalism. However, Hayek was not the only Austrian with post-modernists roots. Von Mises was clear that values and prices are subjective. By this the Austrians do not mean that they are personal or that each person puts a different value on things, they mean unconnected in anyway with reality. Von Mises also said that economics is a value-free science. This may sound high-minded, but science is not value free. Science starts with an objective reality, demands logic and evidence, and morally requires that scientist report data accurately. These positions of Von Mises place him firmly in agreement with the post-modernists (socialists, Keynesians). Some people think I am misinterpreting the Austrian position so here is a video of a talk from the Mises University that demonstrates that the Mises people are serious about the subjective theory of value. They are not saying it depends on your circumstances, they are saying there is no connection to reality between prices or values in economics. The meat of the video starts at 7:35 in which the speaker states “value is just a state of mind.” At 7:57 he is clear that value has no extensive property, which means it is not related to the real world. 8:16 the speaker states that all we have is a state of mind – that value exists only in the mind of the individual. 9:23 value is a state of mind. 9:54 there is no relation between the external world (reality) and the judgments of our minds – this is as clear as it will get that the Austrians are ignoring reality and believe economics is separate from reality. 11:14 The speaker describes profit as subjective. Of course this position cannot logically be held to be true so you will find contradicting statements in the talk. Just like people who deny reality, meaning they deny A is A, the position cannot be held without contradiction. But since they deny reality matters in economics, they free themselves from the science of non-contradictory thinking – logic. This makes the Austrians consistent with the post-modernist (socialist) movement. I cannot say that every Austrian economist makes this mistake, but it is the accepted position of the modern Austrian school of economics and it got its start with Von Mises. The speaker is trying to destroy the intrinsic theory of value. Classical economists followed the labor theory of value which is an intrinsic theory of value. According to this theory the value of an item is the sum total of the labor that went into the item. The Austrians are correct that the classical economists’ position was incorrect, but their solution is no better. They want to say value is determined without reference to the real world – that is it is all in the mind of the valuer, while the classical economists said value could be determined without reference to the valuer. Both are nonsense. Objective valuation has to take the position of the valuer and the item being valued into account. Ayn Rand has a great explanation of this topic in Capitalism the Unknown Ideal starting on page 13 I believe. Capitalism is based in reality, reason, and the ethics of natural rights. Austrians are not capitalists.